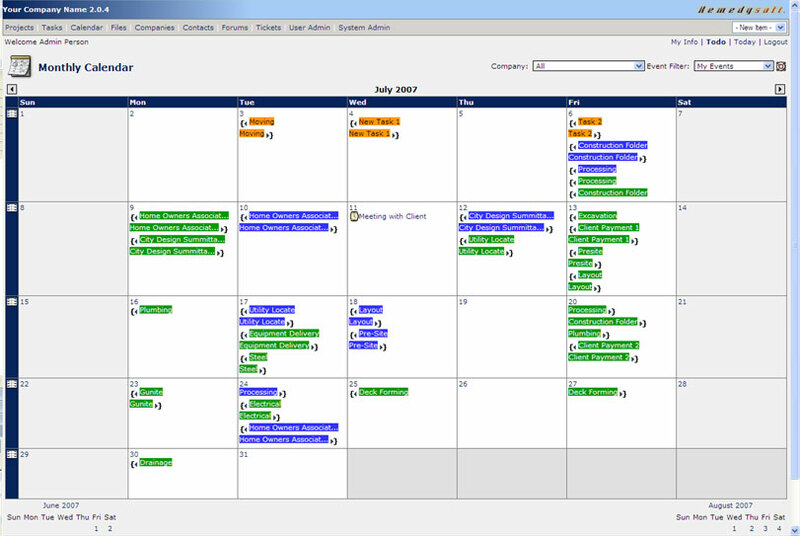 This simple but effective Project Calendar System gives everyone in your company a birds eye view of all of the targeted project start and end dates. It helps reduce missed deadlines! Simply by clicking the "Calendar" Icon on the left navigation panel in the program, you will be presented with the screen shown below. It lists all of the different projects that are ongoing that have a projected start and end date set. This visual representation creates a simple method of overseeing, implementing accountability, and planning ones day. By clicking on your choice of the Calendar links shown in the program you will be taken directly to that Projects details. "Now that we've used Smooth Projects, I can't imagine managing projects without it! Nothing slips through the cracks any longer. It also has allowed us to share project files and ideas in an organized and simple manner." Web Design | Web Hosting | Graphics Arts | Portfolio | HR Software | Copyright 2007 Remedysoft, Inc.